The following are needed when cleaning the camera body and lens by yourself. Brush - This is used to wipe away dust and dirt on the camera body or lens. Use a large or small brush for the lens, whichever is appropriate. Blower - This is used to blow away dust and dirt on or in the camera body or lens. 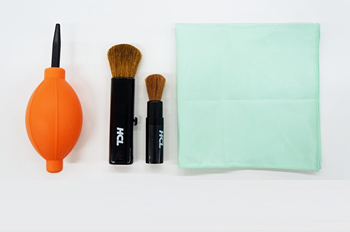 Cleaning cloth - This is used to wipe off dust and dirt on the camera body or lens. A cloth made of synthetic fibers, which can be washed and used over again, is recommended. It can easily remove oil transferred to the rear LCD from your nose. Lens cleaner solution - An optional material used to wipe off excessive dust and dirt on the lens. Using a brush, remove any large dust, dirt, or other particles from the exterior of the camera and lens. Use a large brush for the exterior and small brush for fine parts. Still using a brush, remove dust from around the lens. Using a blower, blow away small dust and dirt particles from the small parts of the camera and the lens. Still using a blower, blow away dust on the surface of the lens. Wipe the lens with a cleaning cloth. If particularly dirty, wet a soft cloth or lens tissue with lens cleaner solution and wipe in a circular motion from the center of the lens. IMPORTANT: Do not apply lens cleaner solution directly to the lens. Doing so may damage the lens. Attach the lens cap to prevent the lens from acquiring further dirt.